You could make lots of these and hang them around the room from lengths of thread - very spooky! Or how about sticking one to the front of a Halloween party invitation? 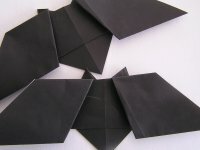 You could even make the bat the invitation, by writing on the paper before you fold it up!